At the height of summer, I thought I couldn’t stand one more day of incessant, ear-splitting cicada screaming. “Miiiin min min miiii,” as they spell it here (pronounced “mean”). I noticed when I came back this week that the sound was quieter, less frantic. A fat, metallic green corpse lay belly up on the bike path in the morning. Then I had to step to the side to avoid a black carcass on the station escalator, the rolling motion rocking it back and forth like a baby against the guard cover at the top. 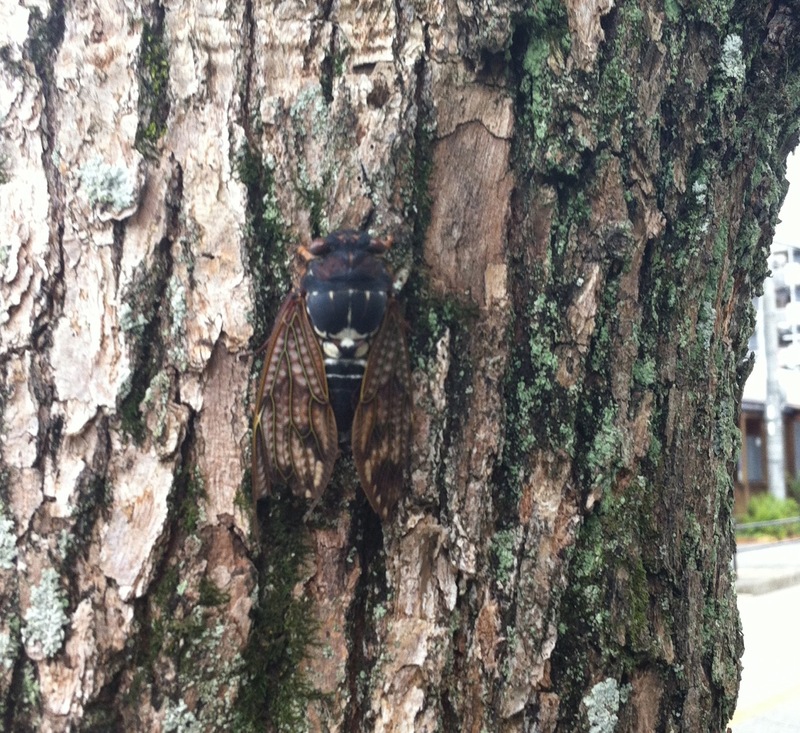 I wanted to get a beautiful picture of a cicada for this post, and if you google them you can find plenty, but when I went out to the park today, I couldn’t find a single one. I didn’t hear one, either. Only crickets and birds–much gentler sounds. My brother, Onini, came to my rescue, though, with this shot he took when he was here in the summer. He said it nearly deafened him as he walked by. Here’s one in a tree in my park, if you squint a little to see it. And here’s a recording I took of one very excited fellow calling for a mate. See if you can last through the whole thing, and then imagine that multiplied by 100s, all day every day for a whole summer. Japan has many varieties of cicadas, but one variety, the kumazemi, or “bear cicada,” is growing in number in western Japan (the area from Osaka down). These black creatures are the biggest, baddest, and loudest of the species, growing to 7 cm and buzzing at up to 94 decibels, enough to cause permanent hearing damage in humans. What’s more, they think that the optic fibers dropping from poles to houses are dead branches just perfect for burying their eggs in. Over 1,000 homes per year in Osaka report lost Internet connectivity due to cicadas, or at least they did. NTT researchers have now developed cicada-proof cables, after observing that the females first scratch the bark off with their ovipositors before drilling their holes. If they can’t scratch through the surface, they won’t drill. Ah well, whether they’re drilling into tree branches or fruitlessly scratching at optic fiber cable, I guess that frenzy of mating and ovipositing is just about over now. The cicadas drop, and then the leaves begin to change. Autumn is coming. It’s a lonely, nostalgic time, as the darkness falls earlier and earlier at the end of the work day. But let’s enjoy the flaming leaves before they fade and the reemergence of the cozy kotatsu blankets. Let’s remember that we can’t have beginnings without endings. Here’s to new paths. I’m rather grateful that I don’t need to burrow through optic fiber cable to find mine. American gal turned Japanese "salaryman" for a while. I'm blogging my experiences as my daughter and I move from Silicon Valley to Japan and beyond. 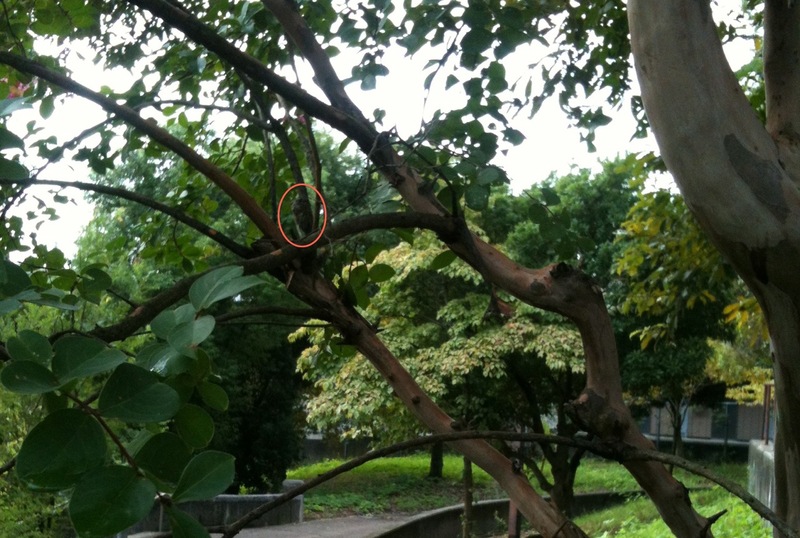 This entry was posted in Osaka and tagged Cicadas, Japan, Kumazemi, Musings. Bookmark the permalink. July I’m so glad to see you writing prolifically again! I was the one who was lonely for your observations of your new home… “on the glass slides of your world”. Hey, that is a science lab reference, right? Japan seems full of really big bugs. Bet the fly-swatters look like tennis rackets over there! Lie the audio recording feature of this entry too. Yeah, the inevitable saddness that fall brings… Unfortunately I think that is universal. Please keep observing and letting us know your thoughts. Your blog has given me a wonderful view of a county that i have never traveled to and one that my father once told me was “one of the most beautiful places in the world”. Your view of Osaka and its people filtered through your scholarly and worldly persona is a gift. So… Thank you, July. And as for the loneliness of fall…maybe with a bit of shared human experience ( of which your blog is definately an important part) , just maybe we will get through this season. Thanks for your steady encouragement, ever since I started this blog. With readers like you, how could I stop writing? I think we’ll make it through the autumn this time around…maybe even relish it.